My streamside companions routinely ask me what tippet I use? They are often curious if I use fluorocarbon or nylon and what sizes I use and carry with me. This blog post unveils my tippet preferences and fishing strategies. With regard to the brand name, I use Scientific Anglers tippet. I’m especially fond of the knot strength and the patented spool cutter that saves me valuable time on the water. 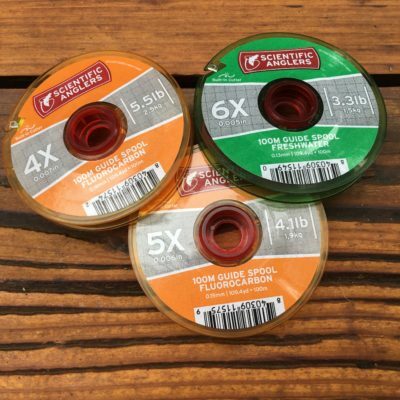 I carry both fluorocarbon and nylon tippet in a wide array of sizes. I stock my lanyard and lumbar pack with fluorocarbon in sizes 2X through 5X and nylon in sizes 4X through 7X. I’ll explain how I use each in the paragraphs below. In Colorado, we routinely use three-fly tandem nymphing rigs to fool tough trout. As a general rule, I use 4X fluorocarbon for the majority of my attractors in my multi-fly rigs. For instance, if I’m using a UV Scud, San Juan Worm, Cranefly, or Pat’s Rubber Legs as my lead fly, I use 4X fluorocarbon to increase my odds of fooling selective trout. It’s virtually invisible to the trout, extremely durable and abrasion resistant, yet has a soft core, which allows life-life presentations. Off my attractor, I attach my second fly with 5X fluorocarbon with all the same goals in mind. My second fly is typically smaller in size (#18-22) so I downsize my tippet. My trailer incorporates 6X nylon tippet material. The 6X nylon is supple, strong, and fools the most selective trout you’ll encounter on western trout streams without any compromise. The nylon tippet has low memory, incredible abrasion resistance, and superb knot strength. I use twice the amount of 6X tippet (in comparison to 4X and 5X) so this strategy is cost effective and environmental friendly. I do not use fluorocarbon for dry flies, but instead opt to fish with nylon tippet. I use 6X nylon for my pale morning dun, red quills, and blue-winged olive imitations, then drop to 7X when fishing with Trico and midge patterns. You’ll need to upsize your tippet when you’re fishing with caddis, green drakes, yellow sallies, or stonefly imitations, so make sure you adjust your tactics and techniques to match the prevailing conditions. Thanks for sharing a nice post on tippet. I think, Your choice and suggestion on tippet will helpful to all anglers.